Green polish and I have a rocky relationship. Green typically isn't the best color for me, unless it's a deep green or a turquoise green. I find this frustrating because green is probably one of the most popular colors among nail polish fanatics. 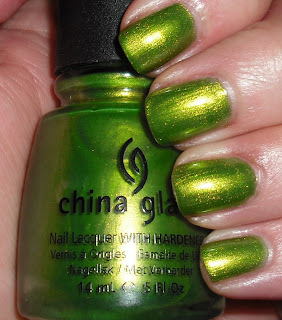 I tend to pass up on most greens, but the latest summer China Glaze green caught my eye. Cha Cha Cha is a lime green with an intense gold shimmer. What I love about this color is the intensity of the shimmer. This looks like green stainless steel. It really does look metallic. What I don't love about this color is how it looks on me. It makes my hands look dirty and ruddy. I kind of figured that while purchasing, but it is a fantastic green. I want to hang on to this one because it's so pretty, maybe I can make it work somehow? I can't wear greens either unless they are like Essie's Turquoise and Caicos, China Glaze's For Audrey or Barry M's Mint Green. I recently bought China Glaze's Turned Up Turquoise and it looked horrible on me. I ended up laying two coats of China Glaze's Blue Hawaiian (a blue glitter) over it and it looked fantastic. I'll use it up but I won't be buying any other greens. I have 3 and that's enough. I'm into blue's now. I have mixed feelings on this shade. I want to love it but I cant and I think it's because it's like a frosty golden shimmer. Does that make sense? I want to re-swatch it to see if it changes mah mind. But anywho lol. i think its a good Green on you. It may be an accuired(sp?) tatse? I have similar problems with greens that have strong yellow undertones. Have you ever tried CG TreeHugger? Green fo sho, but it has a subtle blue shimmer. Definitely a bit more complementary for me. No, i haven't tried that one. I will look out for it though. I'm always looking for greens that will work. Thanks! Yep, new look! Yeah, it's frustrating, because I love that shade of green, just not on me. I do lean towards dark greens too usually for nail polish, they are more forgiving. I think the frostiness is why I love the shade so much. If it were a lighter color and frosty, no way! It does make sense though, frosty stuff isn't for everyone. I think my brain has also attributed to my greens don't work thing. I've really never had luck with greens, so I just assume most won't work. Haha, that's interesting the shades of green that work for you are the ones that really don't work for me. I've had issues with Essie Turquoise & C, but ChG Turned Up Turquoise works great. I try to keep an open mind about greens, but aside for yellow, it's definitely the polish color I own the least of.